We ended our meeting with a professional hand shake. I said my “thank you and good-bye” to the Senior Editor for a well-known Christian book publisher and exited the room, making way for her next appointment to enter. With her business card in hand, it hit me. She expressed interest in reviewing my completed book proposal AND gave me her card. To be perfectly honest with you, I didn’t know what to do with that. I should have been elated. Instead I was numb. Through the strength of Christ, I’ve found legs to stand under layers of disappointment I’ve faced in recent years. Today, the reality that I’ve misplaced my sensitivity to the excitement and whimsical pleasure of possibility gripped me as I left the editor’s presence. At first I didn’t know where to go – back to my hotel suite or to slip quietly into the rear of the room to catch the end of the session I’d missed. The navigation system of my stylish black heels had someplace else in mind. When I crossed the threshold of the prayer room, I almost froze. There were two women praying together, and I felt like any move I made would disrupt the precious atmosphere. I silently slipped into a chair and began to reflect. Moments later a woman from the prayer team joined me. My private nature almost told her I just wanted to be left alone in silence. Instead I shared my immediate thoughts and allowed her to pray for me. After prayer, the sweet woman (whose name escapes me now) directed me to the tables in the back to find my name attached to a name of God. I rounded the table carefully scanning 650 names looking for my own. I was eager to find out to what name His Spirit led them to affix my name. My heart began to pound as I neared the end and had yet run across Monica Watkins. As I turned to walk away, the enemy of my existence began his choral response in my head. He put on a grand performance, singing negative tunes insinuating I’d been forgotten, gone unnoticed, was unimportant, flown under the radar or fallen through the cracks undetected once again. He begged me to agree with him that I shouldn’t have been there, at the conference, meeting with publishers, or pitching a book. The woman who prayed for me was watching the entire time. She whispered to me, “Did you find it?” When I told her no, she immediately jumped up to help me look. She took one side of the table, and I took the other. In no time she bid me come. 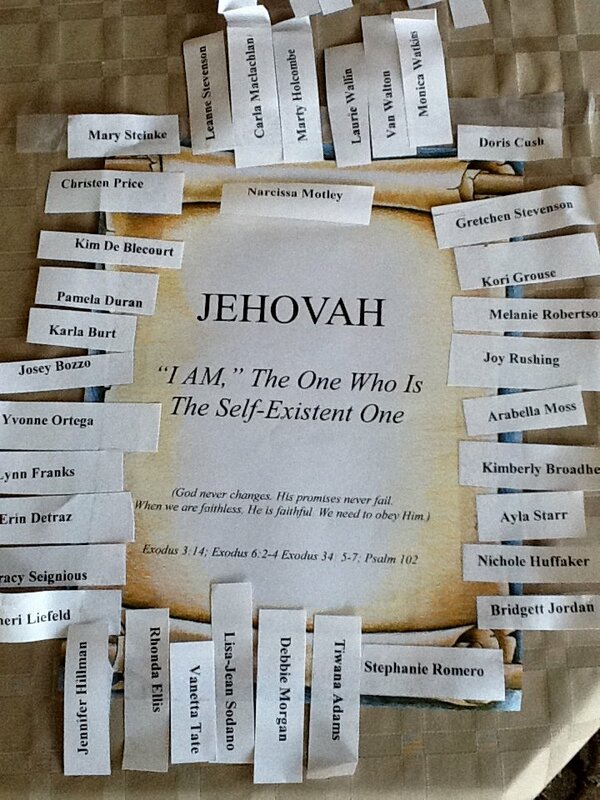 Attached to Jehovah, the great “I AM”! God never changes. His promises never fail. When we are faithless, He is faithful. We need to obey Him. If you’re looking for a place to spend your devotion time today, the verses above may be a nice place to start. They have been for me. Later on, I’ll share which verses stood out most and how I am finding peace in these passages. Monica, looks like you have gotten your writing groove back girl. The enemy is always ready to rear his head and prey on our insecurities. Love that God stays true to His character despite our frailties. GREAT IDEA! You have a fabulous blog! I want to award you with one of my homemade awards: Inspiring Blog Award for all the hard work you do!